One of Albuquerque’s most dangerous roadways is getting a major facelift this week to improve pedestrian and bicycle safety. Zuni Road in Southeast Albuquerque is one of the city’s most heavily traveled urban roadways and the location of a disproportionate number of pedestrian casualties. A 2011 study of traffic data found that the rate of pedestrian and bicycle accidents along the route were more than twice the area average. “Just since I took office in December, news reports have chronicled at least four pedestrians being struck by vehicles on this short three-mile stretch of road, including one fatality,” says City Councilor Pat Davis whose office is funding the majority of the project. County Commissioner Maggie Hart Stebbins’ office has also committed funds towards the project. In 2011, City Councilor Rey Garduno began the planning and fundraising process to improve the road design to include the addition of a center turn lane, bicycle lanes and mid-block pedestrian crossings at locations most often associated with pedestrian/vehicle collisions. Garduno provided the first round of funding necessary to secure matching federal funds for the project, but those funds are not anticipated to be available until 2018. The tab for work this phase is $1.1 million, $900,000 of which for design and striping is funded by bond funds allocated by former Councilor Garduno and Councilor Davis. Remaining funds for road sealing work come from city street maintenance funds. 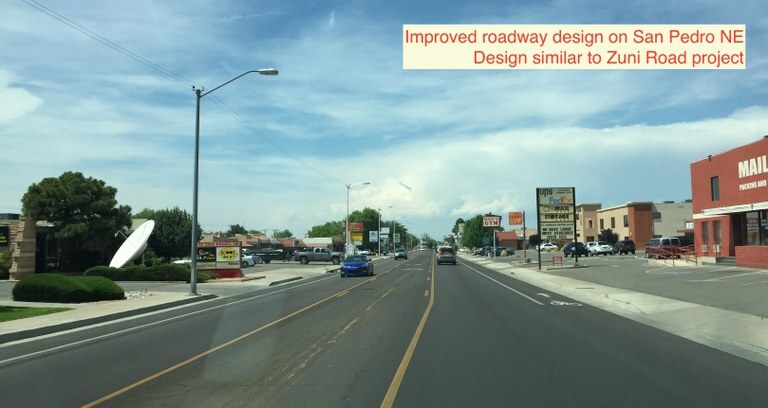 “No one would design an urban roadway like this today,” says City Councilor Pat Davis who succeeded Garduno in representing the SE Albuquerque district. “When I came to office I asked staff to reevaluate the project based on funds we already have available. We found a way to utilize existing funding to complete roadway improvements that will make this stretch of roadway drastically safer now rather than wait to do these improvements along with the intersection improvements coming in 2018,” Davis added. The roadway improvements will include new bicycle lanes, a center turn lane and improved pedestrian crossings at highly trafficked intersections. According to a schedule provided by the city’s Department of Municipal Development, construction will begin in phases this week and continue through July.